Our support is tailored to the needs of your group - in terms of what we cover and how we deliver it. We take inspiration from a variety of educational approaches, to put together a session for you that is engaging and participatory. We support you to draw on and share your own experience; we can also offer tips from our own experiences and insights from other groups. Where possible we give you new shared experiences in the workshops that you can use together to explore an issue or practise your skills. Our focus is on designing and facilitating participatory processes, enabling participants to contribute equally, to be heard and to be involved in the final decision. 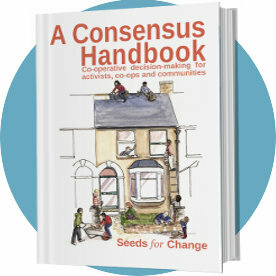 We are particularly experienced in supporting groups that use consensus decision making, see our written consensus and facilitation resources. We will take time to understand your group or organisation, and prepare thoroughly to create a well-structured plan which best fits what you are looking for. This might include some back and forth with different members of the group to check we're getting it right. Where possible, we are also ready to adapt those plans in response to what emerges on the day! Between us, we amass over 50 years experience as campaigners and co-operators, and each have at least 15 years behind us as trainers in a variety of situations. We are closely involved with the movements we support, which means our training is relevant and grounded in a good understanding of your context.